Head injuries, including concussion and traumatic brain injury (TBI), are among the most serious types of personal injuries, other than wrongful death, that we typically see. The reasons are somewhat obvious when doctors consider a “minor” brain injury can have lifelong consequences for the victim. One of the things known to reduce head injuries – or at least the severity of them – is the motorcycle helmet. Motorcycle helmet laws, however, vary widely from state-to-state. There is a large sector of the motorcycle riding population that wants nothing to do with a helmet. They feel that it is not worth riding a motorcycle if you cannot feel the freedom of the wind in your hair and face. 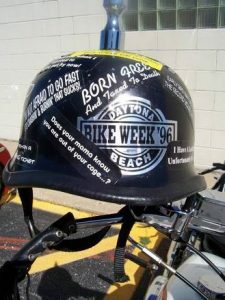 While Massachusetts has a mandatory helmet law, not every state does. Michigan, for example, used to have a mandatory helmet law and then repealed that law. According to a news article from Fox News, many riders have decided to stop wearing helmets there, since it is no longer the law, and this reduction in the number of helmet users has been met with a corresponding increase in the number of head injuries and deaths. In many ways, this is not surprising, since the helmet will significantly reduce the number of head injuries, just like wearing a seat belt significantly reduces the numbers of serious fatalities in auto accidents, but many people are still resistant to wearing them. The question then becomes whether not doing something to prevent injury makes you negligent, and, if you are injured, does that possible negligence affect your ability to recover damages in a personal injury lawsuit. As our Boston personal injury lawyers can explain, the answer to that question could be yes, but that doesn’t mean you still do not have a case. There are four elements in a negligence action in the Commonwealth. In order to win at trial, it is necessary to prove that there was a duty owed to plaintiff by defendant, that the defendant breached his or duty of care, and that the breach of this duty of care caused damages. The duty is a duty to act as a reasonable and prudent person so as to prevent injury foreseeable injuries to foreseeable persons and property. So what happens if the defendant is clearly negligent in causing an injury to plaintiff, but the plaintiff might not have been injured if he or she was wearing a helmet, for example? When the defendant makes such a claim, it is known as an affirmative defense of contributory negligence. Even though Massachusetts is a comparative negligence jurisdiction, we still use the term contributory negligence when describing the plaintiff’s potentially negligent conduct. We not generally say he or she was comparatively negligent. More specifically, Massachusetts uses 51 percent comparative negligence method which means that as long as the plaintiff was less than 51 percent negligent, he or she can still recover, but the recovery will be reduced by his or her percentage of fault.